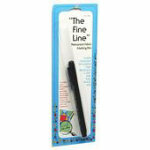 Pinpoint tip marker that produces a very fine thin black line that is permanent. It will not wash out. Replace cap when not using to prevent the ink from drying out. Box of 6.